I’ve always been really into reading. Last year I got an iPad for my birthday and it has changed the way (and frequency) I read books. On vacation, instead of lugging heavy books with me, I can read 2-3 as they’re all loaded in my iPad. I still miss the touch of books, so occasionally I’ll borrow or mix in reading real books. I’m pretty late to the game in terms of an eReader anyway. Nonetheless, in the last two years I’ve been gobbling up (no pun intended) as many food-related novels or memoirs I can get my hand on. It’s another connection to food for me and often, the authors are an inspiration to me while I can continue my lifelong quest of everything food. 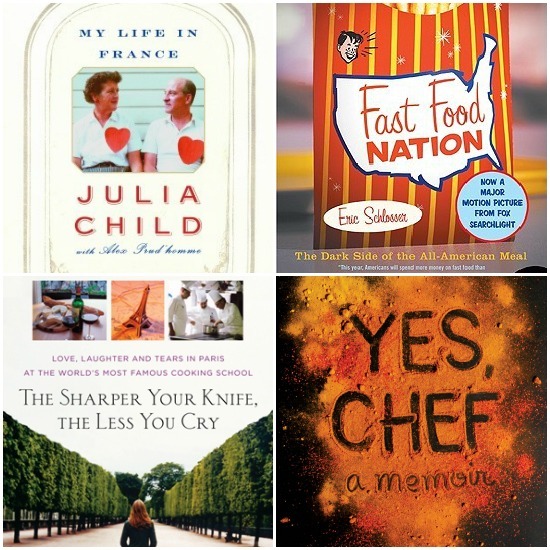 I’ve compiled a list of my favorite foodie books here. You can see my GoodReads profile here and I have a growing section of foodie-books listed there, as well. I’ve not included cookbooks in this list – it’s really just stories where the focal point is food. A majority are memoirs and these are the standouts for me, thus far. Blood, Bones and Butter: The Inadvertent Education of a Reluctant Chef by Gabrielle Hamilton – Gabrielle is a female chef and owns the acclaimed restaurant, Prune, in New York City. Prior to Prune this story recounts her life growing up, figuring out what she wanted to be, her sexuality, relationships and always, navigating her life alongside the meaning of food for her. She’s an incredible writer (not all chefs are) and her story is told in a raw, gritty and humorous way. I wish I could read this for the first time, over and over. Farm City: The Education of an Urban Farmer by Novella Carpenter – Novella is a writer by trade, so her storytelling pulls you in immediately. She recounts her mission and adventure in building and maintaining an urban garden in inner-city Oakland. I learned a good deal about farming, I laughed a lot and was touched by the heart in this memoir. Garlic and Sapphires: The Secret Life of a Critic in Disguise by Ruth Reichl – Ruth is one of my favorite food writers and I follow her closely. I have read all her books (and honestly, they all deserve a place on this list) but this one entertained and delighted me the most. Ruth tells her experience as she became the infamous New York Times Food Critic and all the disguises, costumes and “people” she became to hide her true identity as she dined her way around New York. Because it’s a memoir, the colorful stories are even funnier. Also from her that I love: Comfort Me With Apples and Tender at The Bone. The Dirty Life: A Memoir of Farming, Food and Love by Kristin Kimball – Kristin was a 30-something writer living in New York City. Her life changed when she met a farmer for a piece she was doing, that lived completely off the land. The book follows their love story, the farm they build together and the usually funny antics of a city girl, learning to farm. Their dream was to sustain a community through their farm and crops and I love that concept as neighbors came by every Friday night for their “share”. I learned a lot about farming in this book and appreciated her honesty in the good, bad and the ugly in her memoir. My Life In France by Julia Child – This is Julia’s unfolding story and the genesis of her career in food. She shares how it transforms her life (she didn’t even begin cooking until she was 36) and humbly of course, how she revolutionized the way we cooked with her food empire. Her joy is palpable and you can feel her spirit and determination throughout the book. Finally, the way the French food is described and shared, will make your mouth water. What’s a good food book without Julie Child being in the mix anyway? The Sharper Your Knife, The Less You Cry by Kathleen Flinn – In an Eat, Pray, Love-esque memoir, at age 36 Kathleen found out her corporate job had been eliminated when she got back from vacation. 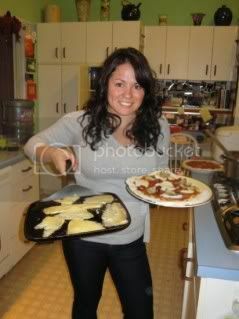 Instead of climbing back up the ladder, she moved to Paris to pursue her lofty goal of attending cooking school at Le Cordon Bleu. Kathleen goes through the motions of fear and loss, as the program is intense. So many people can relate to her story, but she doesn’t sugarcoat the experience. I love the title of this book (actually a quote from her Chef instructor when talking about onion cutting and sharp knives) and recipes are also woven throughout this book. Fast Food Nation by Eric Schlosser – I read this book in college and also saw Eric speak as he came to campus so I had a lot of classes, papers and discussions around this book and topic. He covers the American culture, obesity, slaughter-houses and Midwest farming all with deductive reasoning, factual research and dry wit. The facts are pretty depressing actually, but I think it’s important to read and understand what’s happening around us. It is after all: the dark side of the All-American meal. Yes, Chef: A Memoir by Marcus Samuelsson – Marcus Samuelsson is someone I respect as a person and as a chef. I know his restaurant well and see him throughout Food Network but knew nothing about his personal life. He was adopted from Africa, grew up in Sweden and found his way to being a Chef totally on his own accord. His journey to America and from restaurant to restaurant, quite literally working his way to the top is really interesting. He’s not quite the writer Gabrielle Hamilton is, but his story is just as compelling. His story is worth the read. Animal, Vegetable, Miracle by Barbara Kingsolver – Barbara’s writing is very compelling and with her first non-fiction book she accounts living off the land for one year with her family. They vow to only buy food raised in their own neighborhood or grow it themselves, no exceptions. Although it may be extreme to some, it is filled with stories and even recipes from her husband and one of her daughters throughout the book, that is very much a journalistic introspection. I really enjoyed it, albeit slow at times, there’s a lot to learn from her exploration and story. [Note: Not pictured in blog post images above]. How did I miss this post? I love The Dirty Life. Have you read Animal, Vegetable, Miracle? Love that book. Oh goodness, I have. I read it a while back – how could I have forgotten?? I love her writing. You just reminded me that I totally have to include it on this list 🙂 Updating now! I was searching for other foodie book lists and found you! 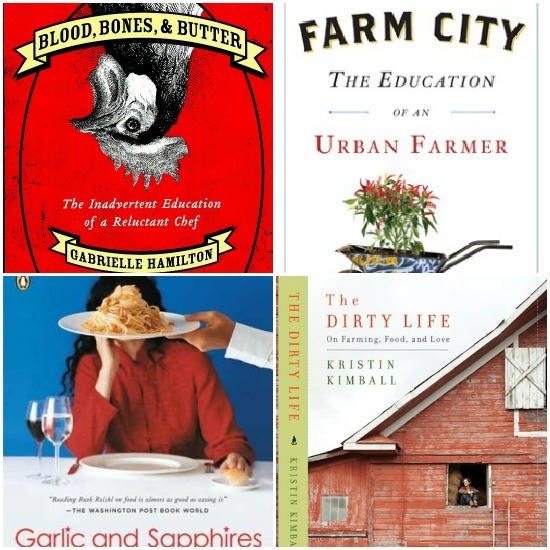 I am adding this link to my Foodie Reads page. Thanks for the new recommendations! Great! I love your list too. I’m always on the look out for the best 🙂 Thanks for stopping by.